Anne V. Coates arrived at the 2016 Governors Awards in Los Angeles. 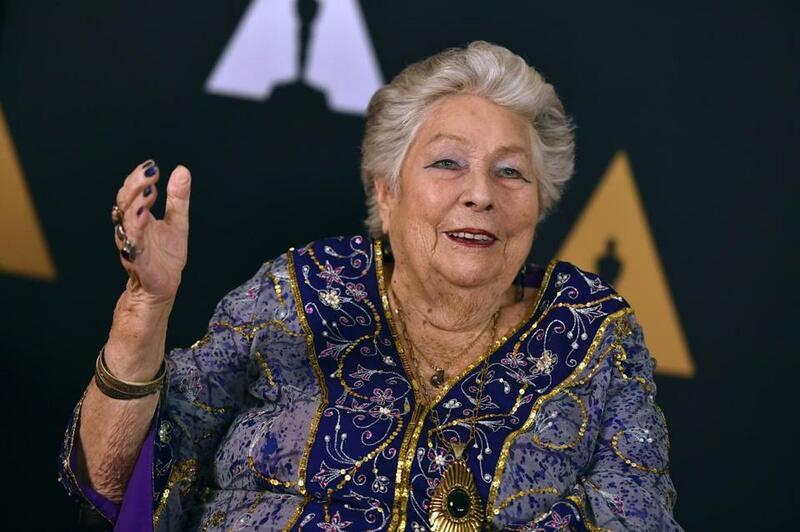 NEW YORK — Anne V. Coates, an English surgical nurse who forsook her calling to perform surgery on some of the best-known motion pictures of the 20th century, earning an Academy Award for film editing in 1963, died Tuesday in Woodland Hills, Calif. She was 92. Her death, at the Motion Picture & Television Country House and Hospital, was announced on Twitter by the British Academy of Film and Television Arts. In a six-decade career that took her from England to Hollywood, Ms. Coates worked with some of the best-known directors of her time, including Michael Powell, Milos Forman, and Sidney Lumet, receiving four more Oscar nominations along the way. The film editor’s craft is often called “the invisible art,” but it is one of the most vital ingredients in the alchemy of filmmaking, transforming the director’s raw footage into a cohesive motion picture. It was an alchemy long performed in darkened rooms, where white-gloved editors could be seen peering at strips of celluloid held to a light before the frames were sliced and rejoined by hand. To the editor falls the responsibility of creating the film’s flow and dance, through the painstaking selection of shots, camera angles, cuts, superimpositions, and dissolves. An indication of Ms. Coates’s prowess comes in the fact that Lean engaged her for “Lawrence of Arabia” in the first place: He had begun his film career, in the era between the wars, as an editor. One of the most celebrated editing moments in world cinema, critics agree, occurs in that film. It involves an on-screen juxtaposition of the kind known as a match cut, where the cutting highlights affinities between two successive images. In one scene, T.E. Lawrence, a junior British army officer during World War I, is ordered to the Arabian Peninsula. Receiving the order, he leans over to light the cigarette of a British diplomat (played by Claude Rains), then stares transfixed at the still-lighted match between his fingers. Lawrence blows out the match, and in the instant he does, the action cuts from the smoldering flame to a panorama of the sunrise over burning desert sands. In that single cut — born when Ms. Coates looked into O’Toole’s eyes and chose to splice two discrete bits of film together — is contained the passage of time, a journey through space and a delicious visual pun: a literal “match” cut. The director Steven Spielberg has described that cut as “the transition that blew me away” when he first saw the film as a youth. The daughter of Laurence Calvert Coates, an architect, and the former Kathleen Voase Rank, Anne Voase Coates was born on Dec. 12, 1925, in Reigate, in the English county of Surrey. She had, she recalled, “an overprotected upbringing” in an impeccably bourgeois family. “One of my first memories was watching the parlor maid iron The London Times so there were no crinkles in it before my father read it,” Anne Coates said in a 2016 interview. As a teenager, she was smitten by cinema after seeing “Wuthering Heights,” the 1939 epic starring Merle Oberon and Laurence Olivier. She determined to have a career in the movies. But she would first have to overcome the objections of her uncle, the eminent English film producer J. Arthur Rank. A devoutly religious man, he was determined to protect her from the fleshpots of cinema. Instead she went into nursing, working in the plastic surgery center in Sussex established by renowned surgeon Archibald McIndoe, which specialized in rebuilding the faces of servicemen badly wounded in the war. When the work became too harrowing to sustain, Ms. Coates vowed to find a way to make a career in cinema. She would need to overcome not only her family’s resistance but also the fact that the industry had few jobs open to women. Her uncle relented enough to find her a job with the religious-film arm of his company, which made devotional pictures for churches. After her apprenticeship there, where she ran the projector and made the tea, she caught on as cutting-room assistant at Pinewood Studios, the facility her uncle had established outside London. Early films to which she contributed included “The Red Shoes” (1948), directed by Powell and Emeric Pressburger. At Pinewood, Coates’s boss was a white-haired editor who left each afternoon at 4 to tend his garden. “He would say, ‘You finish it,’” she recalled, and that was how she truly learned her craft. By then Ms. Coates knew she had found her calling: Editing was one of the few branches of the industry relatively hospitable to women. “Women are mostly mothers and directors are mostly children, so the two go very well together,” she said in a 2005 interview. In the 1980s, Ms. Coates brought her art to Hollywood studios. Her other Oscar nominations were for “Becket” (1964), directed by Peter Glenville; “The Elephant Man” (1980), by David Lynch; “In the Line of Fire” (1993), by Wolfgang Petersen; and “Out of Sight” (1998), by Steven Soderbergh. She was awarded an honorary Oscar in 2016. Ms. Coates’s marriage to the English director Douglas Hickox ended with his death in 1988. She leaves two sons, Anthony and James, both directors, and a daughter, Emma Hickox-Burford, a film editor. Ms. Coates — who worked into her 90s and one of her last credits was “Fifty Shades of Grey” (2015) — became skilled in digital editing. Though she grew to appreciate its capabilities, she said, she sometimes missed the “lovely magic” of taking a strip of celluloid in her white-gloved fingers and holding it to the light.